It’s rare for one newspaper clipping to suggest as many records as this one does. But given all the claims this article makes, validating those claims with other records is advised. 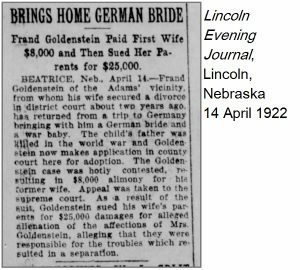 The Lincoln Evening Journal of 14 April 1922 (available in digital format on Newspapers.com) contains “news” on Frank Goldenstein (styled “Frand”), indicating that he had recently returned home to Nebraska from Germany where he had married a German woman who had a child with a man who had been killed in the first World War. The article goes on to reference Goldenstein’s divorce from a previous wife and the legal difficulties that followed. passenger lists of Frank’s return to the United States with his new bride in 1922.
adoption records for the child of his “German wife.” These may or may not be sealed, but the child should be named on the passenger list. typos can prevent things from being found–if I had searched for “frank goldenstein” on Newspapers.com, I would not have found this entry as he is styled “frand” throughout the article. newspapers (and other records) may provide information that is sealed in other records. This newspaper references the adoption by Goldenstein of the “war baby.” That child’s adoption may be sealed, but the passenger list would name the child. newspapers can be incorrect. There could very easily be key details in this newspaper account that are incorrect. That’s why details in this article should be confirmed with other records. war babies. That apparently was a term used to refer to children of servicemen who died in the war. This Frank Goldenstein is a member of my extended Goldenstein family and a first cousin to my great-grandmother, Tjode (Goldenstein) Habben (1882-1954). This entry was posted in Uncategorized and tagged frank goldenstein. Bookmark the permalink.